Where did Ollie Owl come from? Ollie Owl is the brainchild of two Victorian mums passionate about good quality sleep and its vital importance to the general well-being of children. Our pillows are designed in Australia by both Tania and Leigh who is a chiropractor with twenty years experience caring for kids and families in her practice. Why Ollie Owl pillows for children? The motivation to actually design and manufacture their own pillows was really a result of trying to buy pillows for their own young children. They soon realised there did not seem to be a company out there that designed pillows exclusively for children. As Leigh was a chiropractor it made perfect sense to use her experience to design the perfect pillows to suit growing little bodies. How is this different to other products available? The Ollie Owl products are designed to meet the individual and specific needs of developing children. Children have a different growing anatomy to that of an adult and we felt this should be taken into consideration when designing pillows for them. Our dream range pillows are made of a low resilience foam that provides an initial comfort feel, as well as provides the user with deep down support. It is soft to touch and provides fast recovery after deformation. This foam is manufactured using Variable Pressure Foaming (VPF) technology, resulting in a better quality, more durable and greener product. Our dream range pillows also contain CompriShield which is an Anti-Microbial Protection solution that is infused into the foam. It is a natural, sustainable and bio-based microbial control solution that is derived from coconut oil. The solution will not leach out of the foam in its lifetime, due to it being locked and bonded to the foam’s surface. When it reaches the end of its life-cycle, the components of CompriShield breaks down into oxygen, nitrogen and sand. This allows for a safe and easy way for the solution to be recycled back into the environment. Hence it provides a product that is not only environmentally friendly, but is safe for children and pets. Another reason it is great for people and pets is that it provides an efficient protection mechanism against dust mites, mould, odour and mildew. Dust mites are one of the major causes of allergies and asthma. CompriShield is able to control the dust mite populations by eliminating their food sources, such as mould and bacteria. It is able to do this by setting up a series of molecular road spikes on the surface of the foam. The pathogen is magnetically attracted to the spike (due to the positive charge of Nitrogen), resulting in the cell wall being pierced. This allows for water to enter the cell wall until it gets too full. When this happens, the cell loses its structural integrity, leading to its destruction. This prevents bacteria from adapting the foam’s surface, and therefore allows CompriShield to protect it over the long term. We wanted to design a pillow good enough for our children and we weren’t satisfied with a regular pillow. Why not use a regular pillow? Regular pillows are usually made from polyfill, the fibres of which flatten with use, providing minimal or no neck support. Even expensive feather and down pillows have nothing in them to maintain a contour or shape. During the night the shape and support of most regular pillows is lost and people find themselves trying to reshape their pillows during the night. For your child’s spine to be naturally aligned during sleep it is recommended to use a pillow with a contour to support the neck as well as the head. Why is my pillow turning yellow? We all age but it doesn’t mean that we don’t work just as well. This is the same with your pillow, It’s a natural part of a memory foams aging process to turn yellow. This is nothing to be concerned about the colouration is due to the oxidisation of the foam and is not toxic or harmful in any way. As a chiropractor I encourage my patients to sleep on their side. Patients are often surprised to learn that sleeping on their stomach is not good for them. A quick lesson in logic usually helps them understand why. I get my patients to look over their shoulder for a timed minute. At the end of this I ask them how they feel. Invariably they report some neck and shoulder tension….and this is only after 60 seconds. Imagine what sleeping on your stomach does for a whole night! While sleeping on your stomach may feel good and seem perfectly acceptable, it is the long term effects that people have to consider. For my younger patients I try to teach them good habits from the very beginning. As parents we need to be encouraging our children to lie on their sides using a good, supportive pillow to encourage side sleeping. For adults, extra benefits of side sleeping is often a reduction in snoring. Can your pillow be used for different sleeping positions? Although Ollie Owl pillows are designed to encourage side sleeping, back sleepers can turn the pillow around and use the lower profile for more comfortable support. Sleeping on the stomach puts the neck in a twisted position so it is not recommended. Ultimately the goal is to learn to become a side sleeper so that the spine remains in a neutral position for those all important hours while sleeping. My child is 8 and has been on the same pillow for as long as I can remember. How can I get him to change over to this pillow? The most important thing for parents to remember is that our children will follow our lead when we are confident about our decisions. Whether you’re 8 or 80 it is never too early or too late to change our habits, particularly when they can benefit your health and well-being. It is so important for parents to be proactive when it comes to the health of their children. Prevention is always better than cure and taking better care of our bodies when we are young no doubt has enormous health implications for the future. Every child deserves an opportunity to be their best self. Every child deserves an Ollie Owl pillow. Since launching Ollie Owl pillows we have had an overwhelming response by mums telling us how much their new pillow has improved their child’s quality of sleep. We have spent the last eighteen months designing and developing this product and we are so excited how well it has been received by mums and dads across Australia. When should I buy my child his/her first pillow? Through our research from both SIDS and Kids Australia, Department of Health and the Health Nurses Association it is recommended that a child should start to use a pillow when they move out of their cot into a bed. 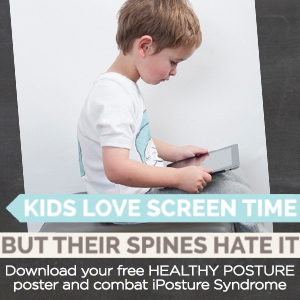 It makes good sense to get their posture right from the beginning so that their developing body is well supported. What a great way to start their healthy sleep life with their very own Ollie Owl pillow. Where can I buy Ollie Owl contour pillows for kids? Ollie Owl pillows are available here on our website, as well as from many reputable health professionals and other stockists. Click here to see a list of stockists. Will it take time for my child to get used to a contour pillow for kids? Like anything new, a contoured pillow for children Australia may take a little getting used to. So far all the reports from our trial pillows are that kids love having their own pillows and, in particular, they love the new shape. Children seem to be quite intuitive when it comes to their own health and they seem to be more comfortable and at ease the minute their head hits the pillow. Once kids have these pillows they seem pretty reluctant to give them up, even just to give a sibling a try. Does the Ollie Owl pillow fit a regular pillowcase? In most cases our pillow will fit into either a full sized pillowcase or a cot pillowcase. For the perfect fit we have designed pillowcases for each of the three sizes, available in our online shop. Is there any refund or return on the pillows? Your satisfaction is our priority. If for any reason our pillow does not meet you expectations contact us at once and we will endeavour to resolve the issue or refund the purchase price. How long should our kids pillow last? We offer a 12 month warranty on our pillows; with correct care your pillow can last up to three years. How to wash and care for my Ollie Owl kids pillow? Spot clean with warm water and a mild detergent. Do not soak, machine wash or tumble dry. Dry flat away from direct sunlight. This process is simple, only takes a few seconds and yet can be the difference between choosing a poor quality, ill fitting pillow or a great pillow that will support your child in supreme comfort as they grow. Lay your child on their side. Notice the gap between the bed and their neck. This is the area that needs the utmost support during sleep. The side of the head should simply be cradled by the pillow. Your child should have both their legs bent; make sure the uppermost leg is not bent up higher than the bottom leg. This position helps minimise kids rolling onto their ‘tummy’ during the night. 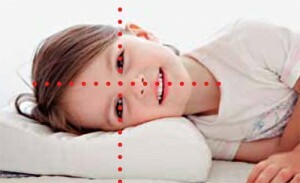 Next, look at the position of your child’s eyes. You should be able to run an imaginary line vertically (from ceiling to floor) through their eyes and this line should be perpendicular to the floor. Now run an imaginary line along the middle of the face, this should be parallel with the floor. If either of these lines is skewed this is an indication that the pillow is too high or too low. If the lines are perpendicular to each other the pillow height is perfect. You should encourage your child to start sleeping on their side from the age of two.